Ive actually thought a lot about this subject the last month. Especially in reference to some Charismatic friends of mine. As a former Charismatic Protestant I still really believe in the Supernatural, and it's important to ministry, faith and so on. There is also another paradigm that I don't agree with. It tends to put Spiritual Gifts and Fruit on an equal footing. So I've heard one anology that the Holy Spirit is a dove, and one of his wing is Gifts, while the other is fruit. (IF a person doesn't have the miracoulous gifts then you end with a one winged dove that can't fly). Anyway some of these ideas I just disagree with. Based on personal experience, but also on Church history and so on. Here's a quote from an essay, from my Church on the general subject. The martyrs left us with many lessons and examples that impact upon our lives today. Most probably the most valuable is discernment between Fruit of the Spirit and gifts. Fruit of the Spirit has to do with life and eternity. Gifts are mostly for the benefit of others and can possibly lead to pride and vainglory. Gifts are referring here to wisdom, knowledge, faith, healing, working miracles, prophecy, discerning of spirits, tongues, and interpretation (I Corinthians 12:8-11). The martyrs were primarily concerned with Fruits of the Spirit rather than gifts. The martyr's Fruit of the Spirit made him all-powerful in everything. "You shall receive power when the Holy Spirit has come upon you; and you shall be WITNESS TO ME? ?mp;quot; (Acts 1:8). This was the promise of the Lord to His Holy Disciples. Attesting to this, a powerful person, such as a martyr, overcomes fear of losing his life, his ministry is powerful, and they have a strong influence on others. Fruits of the Spirit will distinguish him in every good deed. The power and strength of the martyrs was found within the work shared with the Holy Spirit. They felt the power of God within them. They were spiritually strong and without weakness. They had communion with God'spirit. Anyway as I think Seraphim and possibly others mentioned. Many of the great saints, really pursued godliness (the fruit). And they had the gifts manifest because of there relationship with God, to confirm their message and so on. And I think some of the controversy over the gifts comes from people treating the gifts simply like a natural talent "that they operate". I realize the topic is complex. And there is more to it than that. 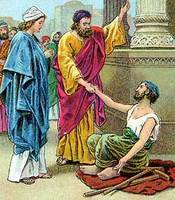 For instance,there is the issue of false ministers like Balaam that can do miracles because of their faith. And God can use their declaring the Gospel (even if it is for their own gain) for his glory and purpose. I also would mention that in this area there can be a lot of preconceived notions in this area. Especially in the area of what we see as being "Spiritual". I met some former Charismatic aquaitnences of mine, that I hadn't seen in years. And had a good time. But at one point, there was some dis comfort. Because they wanted to pray to bring the Charismatic Revivial into the Coptic Church. And that was something that I balked at. And it wasn't for the reason that I'm a Cessionist. Far from it. The reason came more from what I could tell from some of the underlying assumptions or connotations. Specifically speaking they seemed to only recognize revials and things that fit the Protestant ideas, and were unaware of Spiritual movements going on in my Church. That were very moving, and at times miracoulous that did not fit those notions. Anyway my point is. Just because soemthing doesn't look like the Vineyard, Brownseville, Toronto etc. doesn't mean that it isn't spiritual. Yeah, I've seen this kind of thing. We know we're supposed to have the gifts of the Spirit but don't obviously appear to, so we start calling our natural talents "gifts". Every perfect gift comes from God, so we really can't take any credit, even for our "natural talents", but the New Testament shows me that when a person receives the Spirit, they are given a new gift - something distinct. It may not be as outwardly spectacular as the gift of tongues or healing, but surely the believer or people around them should begin to notice the difference - "how come Scripture seems so clear to me all of a sudden? ", "Wow, you really explain that clearly, you used to confuse me", "I really have a strong feeling that there is a satanic spirit involved here", etc. Some people seem to say that growth in the Spirit is a gradual thing - and I'm sure that God intends that we do grow in faith as we spiritually mature. But the New Testament depicts people being given gifts all-of-a-sudden, when they weren't even expecting it! This sounds quite different. I have a friend, a very committed Christian, who was seeking the Spirit a few years back. He went to an Assemblies of God church (don't know if you have that in the US) and they agreed to lay hands on him and told him he would receive the gift of tongues as a sign he had received the Spirit. Well, after the laying on of hands, he was told to repeat "Hallelujah" over and over again. This exercise was somehow supposed to allow him to begin to speak in tongues. I don't know if this is common or not, but to me it seems quite different from the Biblical accounts of spontaneous tongues-speaking. Why do you need to get tongue-tied in order to speak in tongues? It doesn't seem right to me. Kent, thank you for your graciousness and forgiveness. And your comments offline. Pavel's comments about the two wings of a dove got me to thinking. Why do we associate the image of the Dove as the Holy Spirit to us? The Holy Spirit showed up as a Dove on Jesus. When the Holy Ghost showed up on the apostles, He did so as tongues or flames of fire. I heard it explained that the Holy Ghost rested on Jesus as a dove because there was nothing in Jesus that needed Judging, or purifying, whereas with the Disciples/Apostles there was still that within them that needed to be judged and purified. This goes back, I believe to an earlier topic of Sanctification that Chris was talking about. We speak of the Holy Spirit as a dove which is not appropriate I believe for us. We speak of the fruit and the gifts, but we don't speak of the need for conviction, self-examination and judgement within our lives. Perhaps if we would seek to live Holy, be set apart and Sanctify ourselves (or cooperater with the Holy Spirit in our Sanctification) we would see both more fruit and more gifts. But to seek only the gifts, or only the fruit apart from seeking Holiness, (notice the 3 here) we are not balanced. Perhaps we need to return to the image of the Spirit as flame, fire and purification. There is much in us that needs to be judged. We need to be aware that we can quench (fire image?) the Holy Ghost. That we can Grieve Him. The Scriptures talk about judging ourselves that we don't need to be judged. hmm. What do you wise ones think? Interestingly enough, the word "seraph" can mean "burning one" - an interesting link to your flame comment. You make a good point: we want all the goodies from God but we don't want to live the life of sacrifice, surrender and love that God wants to help us live. Would God trust His gifts to people who might misuse them? I guess in reference to "fruits of the Spirit", you answer my question about the difference between a true and false prophet - "by their fruits you shall know them", the Bible says. So I guess I'm looking for a prophet that is loving, joyful, peaceful, humble, etc. "Test the spirits," Paul said. There's gotta be a gag here somewhere about a "non-prophet organisation"
"Shocking footage of one of the worst "invasions" of false spirits that the church has ever seen. Proof that she has been invaded by counterfeit spirits on a worldwide scale. This is Part One and Part Two of a documentary tracing this massive invasion - and showing the terrible impact it has had. Please share it with your friends. prophetic, apostolic, todd bentley, lakeland revival, rick joyner, morningstar, toronto blessing, new mystics, john crowder, ihop, mike bickle, patricia king, false revival, the river, bob jones, john paul jackson, sid roth, chuck pierce, bill johnson, randy clark, peter wagner, dutch sheets, pentecostal, charismatic."